I’ll begin in the middle because Hannah Buckley’s Woman with Eggs — ‘a solo about women’s ability to be many things’ — is worth celebrating. It tackles what many women see as the social imperative of having children with a poignancy that is balanced by Buckley’s uncompromising argument for freedom from its tyranny. I am not sure at the beginning where she is going to take us; she is crouched with her back to the audience scratching around on the floor, her hair covering her face that is following intently the actions of her hands. But very quickly Buckley transforms all these elements into one of the most intelligent works I have seen at The Place. By accumulating gestures and revealing clues as to where she is going, Buckley builds up over the course of the work a layered argument so complete and irreverent that by the end we can’t help but stand smiling with her and marvel at her accomplishment. 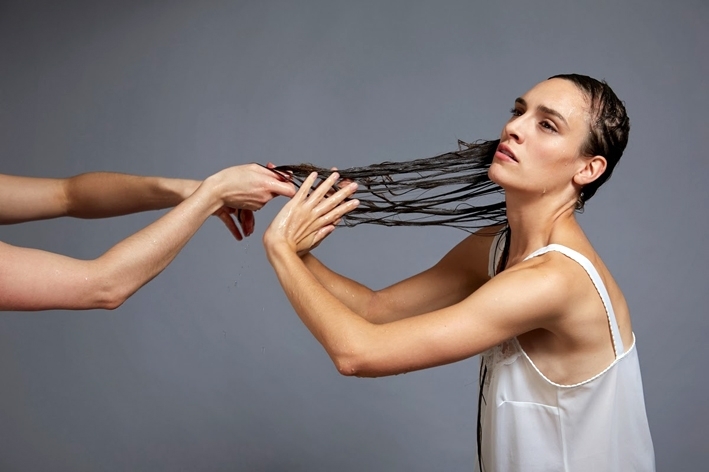 The first spoken clue is a quote from an Inuit folk story, Kakuarshuk: ‘Long ago women got their children by digging around in the ground…’: immediately all that intense scrabbling assumes meaning and from this point each element of her performance — her costume (courtesy of Lauren Reyhani), her hair, her voice, her angular way of moving with turned-in stance and the articulation of her arms — now uncannily combine to inform her subject. Having related the Inuit tale about a barren woman’s quest to find a child she introduces extracts from two interviews, one with a seven-year-old girl and one with her grandmother aged 90: two amusing and refreshing perspectives on ‘women’s ability to be many things’. Buckley dances in her own idiosyncratic way to an Alex Drewchin cover of Kate Bush’s Babooshka, and then suddenly changes tack, dragging herself to a floor microphone to give away her next clue: a refreshingly honest view of children by artist Sophie Calle: ‘…I don’t like the terrorism of children. I don’t like the lack of freedom it gives to the parents…’ She lies still to let the sense of her monologue filter into our consciousness and then takes two gold-painted eggs from a bowl and begins to groove to Grimes’ appropriately titled track, Oblivion, letting the eggs balance precariously in her open palms until she ramps up the rhythmic pulse to the point the eggs spill on to the ground and break. She nonchalantly picks up two more and repeats her dance until the dozen or so eggs lie splattered on the ground around her, a breathtakingly trenchant image of a tyranny overturned with Buckley in the unassuming role of liberator. 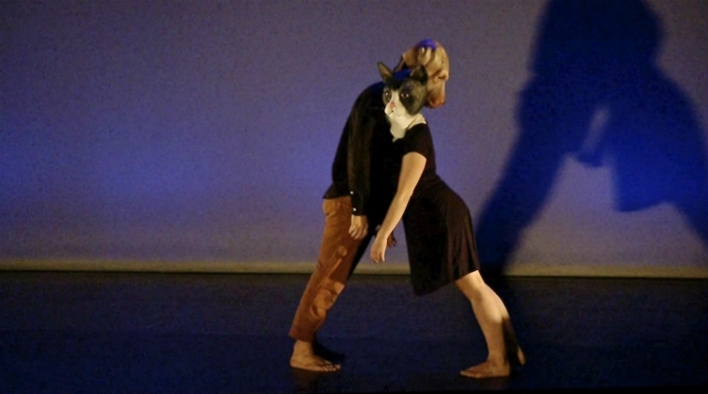 In their masks, Felipe and Cassar carry on an animalistic social dance with the cat appearing the stronger of the two and not in the least afraid of the dog. After sequences of walking patterns, swings and lifts, they end up falling against each other mask to mask for the longest time, their expressions fixed. Masks have a particular power and Felipe and Cassar exploit them well. It is only when they take them off that Pensar é Destruir loses its force, becoming two people with some interesting but not compelling partnering (but isn’t that the sense of the three lines from Pessoa?). Strange, isn’t it, the power the face can have in dance. The unmasked section is accompanied by a Bach concerto (as opposed to Oli Newman and Anstam in the first section) which plays a parallel, playful role to the choreography rather than a structural one. Then just as the partnering gets going in rolling lifts across each other’s backs, both the music and choreography abruptly fade out. 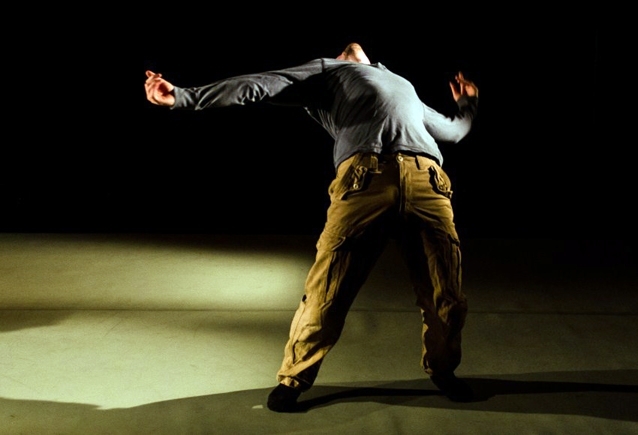 There’s more to be achieved with this idea, and I hope Red Tape Dance continues to explore. The evening closes with Rachel Burn’s Happening, a piece inspired by the stories of twelve men and women that Burn has transformed into dance. The cast consists of only four women, so each interprets three stories across the two genders. Finding a common theme among the twelve stories is clearly one concern and finding a setting that can frame that theme is another; in fact the latter can only be explored following the success of the former. What Burn has done is the reverse: she has found a setting before finding the theme, and although her idea of transparent balloons tied with long strings to as many boots as there are story donors and performers may indeed be an intuitive response, it is not enough to make Happening coalesce. The other issue is that because there are only four in the cast, the work appears to consist of only four stories arranged as a collage. 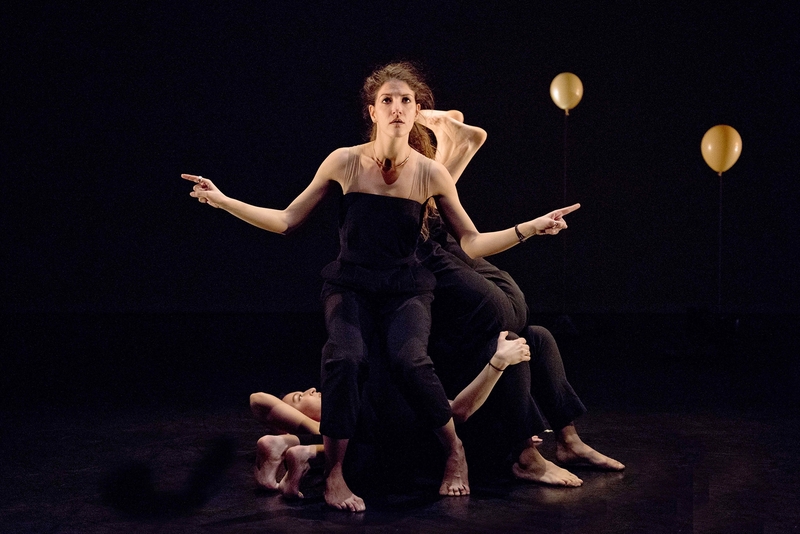 It is a shame, because the abstraction of the words into dance — the choreographic nucleus — is lovely and the performances by Helen Aschauer, Alejandra Baño, Marianna Mouaimi and Ana Mrdjanov emotionally strong. Perhaps adding a man or two to the cast would add more definition to the men’s voices, but finding the right form for all twelve stories remains Burn’s principal challenge. Rachel Burn, Pull Through, Flick. One can almost feel cold flagstones underfoot in the tiny Giant Olive theatre in Kentish Town’s Lion & Unicorn as a sweeping trio of pre-Raphaelite women enters with the somberness of a procession of nuns. Rachel Burn’s Pull Through, Flick builds up images of darkness, pain, and penitence as the women shed and share veils in communal bereavement. 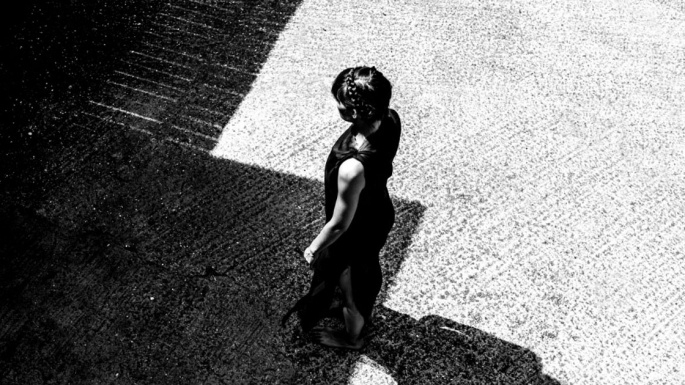 Hildegard von Bingen’s O Pastor Animarium sets the tone as the shape of Lauren Bridle, shrouded in a veil, moves in a grey ecclesiastical light, shuffling from one foot to the other as if loosening her roots. Laura Erwin takes the pose of a classical orator with one hand on stomach and the other at her throat, unable to breathe, unable to speak, a blur of pain as Bridle and Anna Pearce coil around each other and around the stage in mutual support. The tone of Pull Through, Flick is predominantly mournful and the score between the glorious von Bingen bookends does not relieve the gloom, but somewhere in the middle Bridle slips into a stormy, spiral solo that releases a sense of light as if she holds some ineffable secret. Her beautiful lines and circles last momentarily but when she rejoins Pearce and Erwin on their knees and the night of penitence, cleansing and submission descends again, the knowledge of that solo pulls me through. Not a flick exactly, and I’m not sure about the hope, but there was a moment of light. As John Ross kneels in a pool of light, the voice of Matthew Lackford reads the opening paragraph of a letter from the platoon commander of a soldier killed in Afghanistan to the soldier’s mother. Ross replays the soldier’s last moments in a series of abstract gestures — kneeling, crawling, urging, now standing, crumpling, turning — that he imbues with a maturity (gained perhaps through his research) that transforms these gestures into a commanding presence, a commanding officer: signaling, enjoying the danger, throwing himself out of harm’s way, then getting up and seeing it coming. Hit, he crumples, hands to ears, muffling the sounds of gunfire and perhaps hearing the urgent shouts of “Where, where, where?” but unable to respond. We are inside his head, aware of his mortality. Ross stands up looking back at where the fallen soldier lay. He is now the platoon commander, bravado gone, standing at ease with his troops, 19-year old boys any of whom could become, like their former colleague, a dead man. He looks away, tries to take it all in and throws up; he looks for memories, for friends, but finds only a nightmare of loss, throwing up again and violently throwing himself to the ground. Ross shows the reaction to the violent death of a comrade is more violent than the experience of death itself. Defeated by the loss, the violence, the brutality, the commander’s eyes — and Ross’s — seem to have seen what ours have not. He stands, takes off his top and turns his back, on which is written across his shoulder blade Bang! and a small hole just behind the heart: expressing the inexpressible. The performance is not only remarkable for its maturity and in avoiding any cloying sentimentality, but for the sound collage in which Ross has seamlessly layered a grungy, churned up track from Nine Inch Nails with his own thoughtful instrumentation and battleground sounds. A gem. ‘Vanity Fowl follows an ordinary man, full of the usual insecurities that affect us all. A man who craves love, friendship and the need to belong…’ So begins the program note, with a title that could have come straight from early Matthew Bourne. 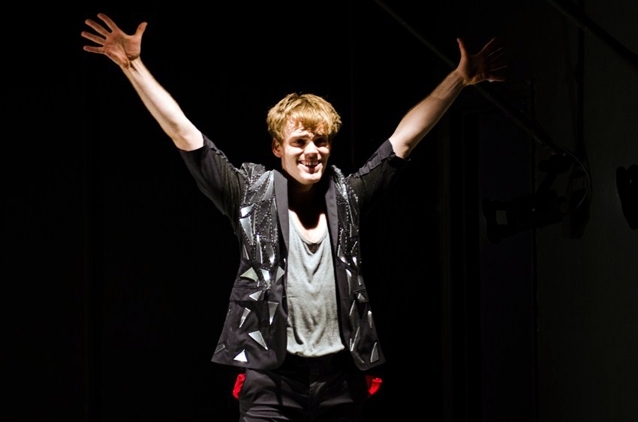 In fact Tom Jackson Greaves has danced with New Adventures and Vanity Fowl was the runner up in the New Adventures Choreography Award last year, but although there is certainly something of Bourne in Vanity Fowl, Greaves has a sincerity and a self-deprecating sense of humour that sets him apart. His style does not wander far from his own physical capabilities, and its idiosyncrasy may prove to be limiting when he creates on other bodies, but here he is on his own territory creating on himself an imaginary rite of passage in three movements, which he labels Commonplace, Grace, and Disgrace. These designations are misleading: the trajectory is from gauche and stammering to rousingly articulate and back to self doubt and despair. The context is set in a filmed introduction, a chic bar peopled with the stylish and the beautiful, where Greaves appears underdressed and out of character with everyone dancing around him. He catches the eye of an impossibly vain man who comes up to shake his hand and ridicule his appearance. This is the point at which Greaves comes on stage to prolong the handshake so we see only his reactions to the unseen man’s overarching snobbery and withering assessment. Greaves’ timing and squirming responses are very funny as he is skewered to the dance floor. The middle, transformative section begins with a Cinderella moment in his flat when he takes from his cupboard and puts on a handsome mirror jacket (courtesy of Theo Clinkard). His inhibitions fall away and he returns to the chic bar to dance his dreams. This is Greaves giving his all, and he does it effectively until the mirrored jacket falls apart, like the clock striking midnight. Self-doubt assails him once again as he props up his smiling face in his framed hands, removes his jacket and curls up on what is left of it in the dying light: not so much disgrace as sincerity about the superficial.